Today, August 17th, we made a two hour trip in a horse wagon along the authentic Flemish cobbles in the village of Kruishoutem, guided by the most sympathetic Marc Verbeeck and his gracious horse Blacky. Marc gave us a taste of the calm and beauty of this gorgeous little village situated between Gent and Kortrijk in Flanders East. 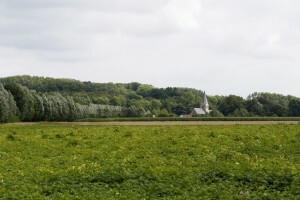 The hills covering the landscape form the natural border between the valley of the Schelde and the Leie. It comprises both majestically great and little charming farms, castles – among which the elegant Castle of Wannegem-Lede inspired by the castle in Versailles, and at present for sale for the impressive price of 13.9 MioEur –, adorable village centers where time seems to have pauzed, and not to forget: a few restored wind mills each with its own little story testifying of the stubbornness, pride and shrewdness of the Flemish people (in this case: of those who could afford to buy and restore a wind will – and judging by the size and splendor of the scattered houses, a lot of capital has gathered in the region of Kruishoutem). Enjoy the ride with me (click on the photo below to start the slide show).